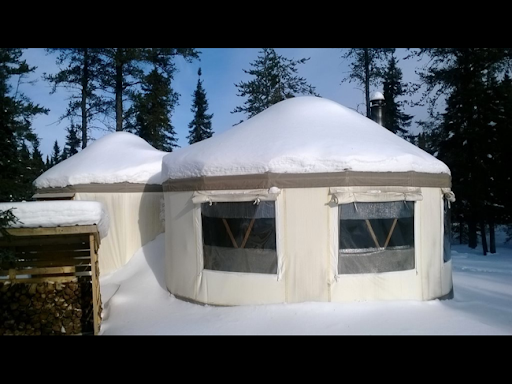 Just in case anyone is curious about how much snow can build up on a yurt roof - here is the current load that our Yurta yurt has been laughing off for a month or two. Well, "road" is perhaps an embellishment. It's really a trail created mainly by Grandpa's snowshoes as he kept a pathway defined for the tractor (initially) and then the ATV (secondly) to get into the bush to retrieve some of the logs we had cut in the fall. It was reasonably warm (about fifteen or sixteen below) so I strapped on my own snowshoes and proceeded to walk over and over and over our trails all morning. I can safely say I covered many kilometres as I listened to various podcasts on my Windows Phone. All in an effort to ensure a hard-packed surface for the ATV. It still had stock tires on, and as such, wasn't a spectacular performer in the snow. Hard packed surfaces seemed fine, but powder rapidly defeated even the four wheel drive. I took a needed break for lunch, and then afterwards Grandpa and Mummu dropped by to give us our mail (one cheque, numerous flyers) and then Grandpa and I disconnected the plough from the ATV and I headed up the trail. Easily navigating to the cabin gave me a false sense of optimism. 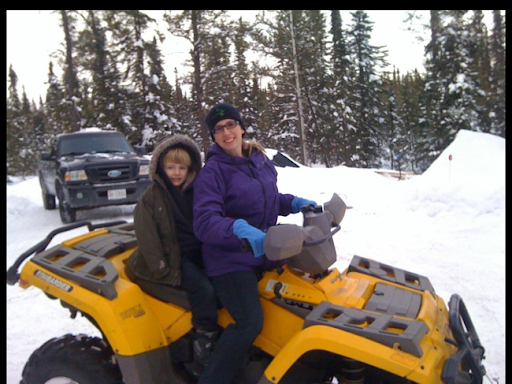 As soon as I got past the cabin, I slid off the packed surface and into some powder. Gunning the engine I was able to climb out of it, and then clawed my way up a short incline where I got stuck at the top. At that point we realized that this was one of our best sections of trail, and the pursuit was not going to be very productive. A short distance ahead was a turnaround I had pre-planned. Experience with the tractor had convinced me to try to have turnarounds at regular spots along any vehicular trails. If we could just get to the turnaround, we'd at least be able to more easily, literally "turn around" and return to the dojo tent with my tail between my legs. Hooking up the extremely convenient winch, I was able to drag myself back onto the trail, and gunned the engine until I was just past the turnaround. With Grandpa pushing, I backed into the turnaround where I got stuck again. Winching again got me on the trail (trial?) and I disconnected and then opened her up to rush all the way back to the firm footings at the cabin. This is disappointing, but not the end of the world just yet. I think I will have to head to town to purchase some standard two-by-fours to complete the interior of the cabin, rather than cutting them myself. Now I have to try to figure out a logging arch or some sort of system for getting logs out of my bush in the summer without dragging them through the dirt. Three sauna sessions ago, I noted with not a little discouragement that the drains had frozen up again. This seemed impossibly horrifying to me, considering the amount of work I had put into ensuring that they would remain open. I was at my wit's end. Heating the drain lines was out of the question. I have to confess that I'm possibly grasping at straws, but I wondered if perhaps the problem is one of flow. If the water isn't getting out of the lines very promptly, it is freezing up in the twenty and thirty below conditions we have been experiencing for the past two months. Looking again at my poly pipe drains with a critical eye, I can see that there were sections with steep drop, and some with shallow drop. As much as I worked very hard to keep a constant downward slope, it was nearly impossible to accomplish with the flexibility inherent in this type of pipe. The other consideration was each coupling. Although the pipe is nominally one inch in diameter internally, each coupling reduces that to more on the order of five eighths or three quarters. As such, I decided that the next course of action would be to replace the drain lines with ABS pipe instead of the polypipe. I had hoped to be able to use two inch diameter piping, but home depot only had adapters for inch and a half piping. This also had the added advantage (which I didn't realize at the time) of being able to fit through the opening I had in the sauna footing for this purpose. Dusting off my mathematics skills, I calculate that the cross section of my poly pipe was πr^2 - (22/7)(.75"/2)(.75"/2) = .45 inches. The cross section of the ABS pipe is (22/7)(1.5"/2)(1.5"/2) = 1.77 inches. I'm embarassed to say how many times I had to recrunch these numbers to be sure they were correct. In any case, as I could obviously see when comparing the ends of the two pipes, I was getting double or triple the flow through the ABS compared to the poly pipe. The other big advantage of the ABS is that it is stiff. This means that I can get the optimal angle throughout the whole run of drain without fear of "dips". Grandpa came over to assist, although he didn't volunteer to go under the sauna - he did pass me tools and stoke the sauna stove. I went under, took various measurements, and then tried to make fit the pieces I had purchased. 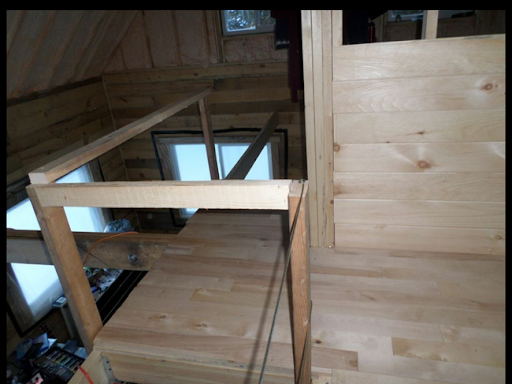 Everything looked great until the very final piece, which was about a foot short to reach all the way through the sauna footing. I opted to leave it for the moment. The hole through the footing still slopes down and away from the sauna. I also opted to leave the pipes as a "dry fit" for now. I will wait until I have the whole system in place, and working properly, before I start glueing too much of it into a permanent positition. Donna and Kenny were away at a session with Eric the Juggler. As soon as Grandpa confirmed that one drain had opened and was flowing through our new pipe, I was up and out of the crawlspace. Grandpa and I poked and prodded at the remaining drain, confident that it would open after a short while of more hot water and patience. As soon as Grandpa returned home, I rushed to the cabin, grabbed my last clean pair of Y-fronts, and returned to the sauna to enjoy the fruits of my labour. The other drain opened, and I enjoyed the warmth and ability to wash up, knowing the water was being carried away to be recycled by nature herself. I overstayed my welcome. I spent over an hour out there until I saw Kenny and Donna out the window, and then headed back inside. Bliss. It will remain to be seen if this is the final solution to my problems. I'm hopeful. Addendum: Checking today, I can see that they are blocked by ice again. This is proving to be quite the conundrum. Last week it was with great excitement that I picked up a truck load of v-joint white pine panelling from Howie's Saw and got it unloaded into the cabin. Now we had a good excuse to begin work on our interior walls! Up until now, we had been living in a VERY open concept cabin. We utilized wire rack shelving as a way of defining the bathroom. It did very little to promote a sense of privacy - we hung our coats on the shelving and that did much to block off the visuals, but certainly no other ways in which a bathroom conveys its presence to our senses. Upstairs was a similar, but perhaps less dramatic situation. Kenny had his area at the east end of the cabin, and Donna and I had ours at the west end. It really facilitated Kenny's mid-night hikes from his bed, over Mama, and in between the two of us. Then the panelling arrived, and shortly after, Grandpa showed up and we proceeded to bring in some of the two-by-fours that I had been milling up until now. We first finished the panelling on the outside wall and ceiling. This allowed us to then proceed to the interior wall. Because the interior wall had a section with a flat ceiling, and a section with an angled ceiling, we opted to build it in two sections. One was a traditional rectangular section, which we built on the floor and then lifted into position. With it secured, we built the remaining irregular wall in situ, toe-screwing (is that a word? If not, it should be...) the studs into position. This was exciting! We could really see two rooms coming into being! One consequence of having the upstairs divided was that there was no longer going to be an easy path between Kenny's "room" and the other "room" - so I extended my temporary railing around the landing and cleared it off. This really opened up things and made it seem that much more finished. 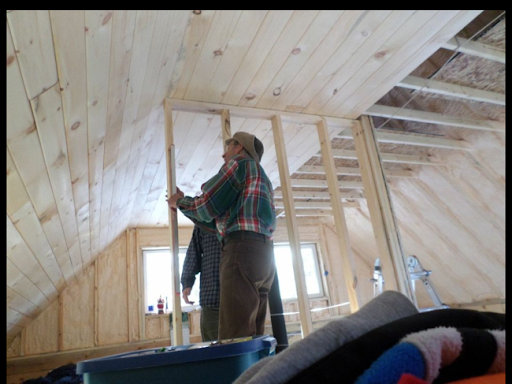 Over the course of the next two days, Grandpa and I cut and completed enough panelling to finish one side of the wall. I left the other side unfinished because I believe I will put most of the wiring in the interior wall - one outlet low and centred for computers or tablets or things like that, and then another, switched outlet up high for some LED lighting. After some discussion, I also will likely add another outlet on the remaining wall which will separate these rooms from the main cabin. I'll try to put it low and towards the outside walls, so that if a desk it positioned under the window, there will be a nearby option to plug in something there. Subsequently, we also worked down on the main floor and were able to frame in the bathroom (most people would call it a "powder room" due to its tiny footprint). We'll see how far my current stock of lumber goes and if we can build up a few more walls. 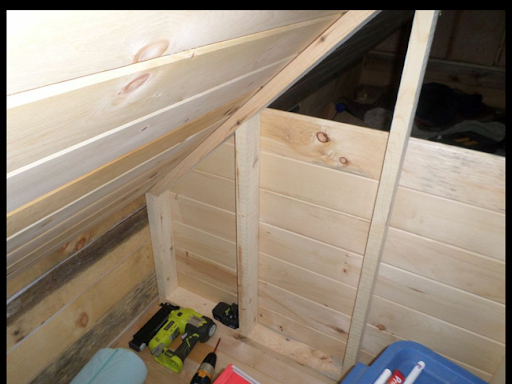 Current plans are that we'll continue to use the main floor "bedroom" as the workshop, and only move into it when the cabin is essentially completed (perhaps omitting trim work). 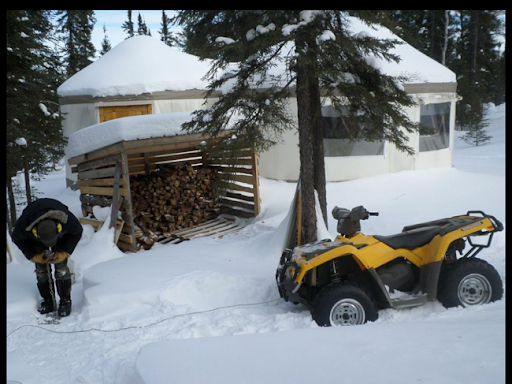 With the ongoing "Polar Vortex" dropping even more -30 degree weather on us for days and days at a time, it was clear that the Yanmar was NOT up to the task of ploughing out our driveway or skidding logs. I can confirm that it was getting more and more difficult to use it as a snow removal tool, having the main blade in BACK of the machine, and needing extended periods of time or generator power to get her running. As such, I started thinking about my needs/wants in a homestead machine, and what was within the realm of possibility. Now that the landscaping was mostly complete, the bucket on the tractor was much more a liability than an asset. It made it difficult to manouver in the bush, and to see how close I was to the edge of the driveway while ploughing. I didn't need the bucket any longer. The diesel engine was also a bit out of place here. It was the only diesel engine we had, so it required its own fuel supply, oil and hydraulic fluid. After a bit of thought, I began to wonder if maybe a four wheel drive ATV would fit in any better. Consulting with kijiji, I saw that price wise, I could likely fetch about the same for the tractor as I would have to pay for an ATV and plough. I mentioned to K! down at KC Automotive that I was thinking of selling the tractor, and later that day his top mechanic, E! called and expressed interest in it for his small ranch. He looked it over that weekend, and then decided he was willing to give it a go and came down a few days later with a trailer to load it up. Grandpa and I spent a bit of time getting her started, as it was quite a cool day, but we eventually did with a bit of a boost. Distressingly, as E! loaded it onto the trailer, grey, foamy liquid began to purge from around the gear shifter. We pondered the implications but E! decided to take the tractor anyway and investigate further. I rushed inside to do a bit of research and it didn't seem as critical as I first thought; it appears to be a fairly common occurance on the Yanmar's that water can leak into the transmission fluid around that gear shift. It should be fixed by keeping her dry and replacing the fluid. Luckily I had given him a five gallon bucket of fluid to go with the tractor. I haven't heard back from him now for a few days, and so I'm assuming that he made out okay. A few days later, Grandpa and I called a fellow who had a Bombardier Outlander for sale, complete with the plough. Upon meeting him down by the Neebing Roadhouse, we discovered that we had an acquaintance in common! Young J!W! who had been working at The Athletic Club here in Thunder Bay - someone I knew well from church! Small world eh? After some friendly negotiations, we agreed on a price and delightfully were able to load the ATV right into the back of my Ranger. Plough and all! 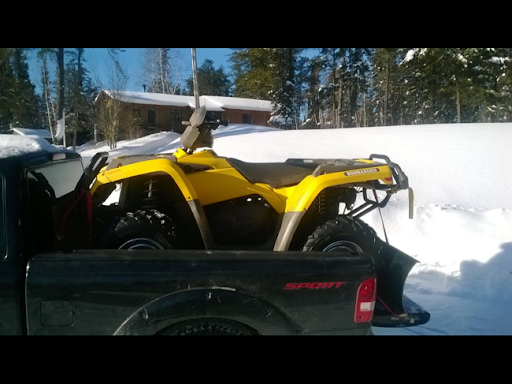 I have to tell you that was quite a relief - arranging a trailer or different truck would have added quite a level of difficulty, and the fact that in the future if I do need to move the ATV for repairs or some other reason, it means much less expense and difficulty. Arriving back at Mummu and Grandpa's house, we proceeded to back up against the berm they had beside the driveway. It still was quite a drop through the snow from the tailgate, so Grandpa and I piled up some two by ten boards to make for a bit of a "ramp" behind the truck. With some trepidation I fired up the engine and hit the gas. Yes, I was in reverse - in case you were expecting another disaster. Actually, she backed off the truck perfectly on the first go. Grandpa drove the truck forward and then kicked the boards out from under the front tires of the ATV. Once she was more level with the snowbank, I simply drove her forward out onto his driveway. We hooked up the plough and I switched to high gear to drive her gingerly along the short shoulder between our driveway entrances. Right away I ploughed out the large portion of our driveway by the sawmill that I had previously abandoned. It went pretty good - I had to push back the banks a few times, raising the plough blade as the ATV began to be rebuffed. This encouraged me to try to plough out the driveway between the dojo tent and the cabin - here's where I bit off more than I could chew. The Outlander couldn't push that much untouched snow (with a hard packed centre where we have been walking) for more than a few feet. 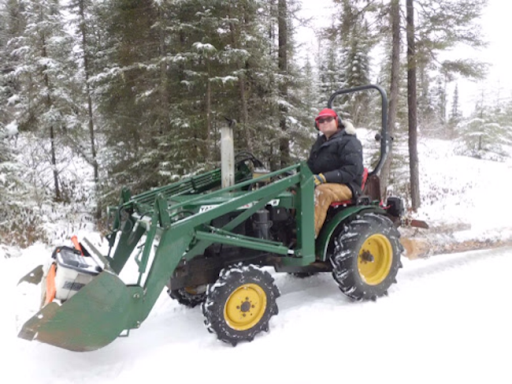 I eventually broke out the shovel and moved the small bank I had created, and then tried to just drive down to the cabin and back. This too was optimistic. The Outlander got stuck twice, in spite of the four wheel drive. I hooked up the comealong and winched her back to the dojo tent. My current thoughts are that I need to pack down the trails that I want to try her out on with my snowshoes first. Grandpa has been doing that already, and now I plan on taking some time to follow up on this. Perhaps tire chains would help? I seem to see mixed opinions on them so I'll hold off on another purchase for now. The plough is a bit of a liability when you are not intending to clear the snow - it makes you much wider, and doesn't raise up high enough to avoid getting caught up on the banks on either side of a narrow path. The plough also means that you can't use the built-in winch to pull yourself free of difficult spots. The Outlander is very challenging to shift at times. It appears that this is a very common problem. I don't want to bend or break my shifter, so I will try the "Outlander Hump" whereby you rock forwards and backwards on the machine while shifting. There is an engine kill switch - I don't see why you would use it, but if you do, make sure you switch it off again (on again? I'm not sure about the nomenclature) before restarting, or you won't be able to restart and will scratch your head for awhile. The starting ability of a gasoline engine in the cold vs. the diesel is just outstanding. It's so nice to be able to fire up the engine inside of one minute, instead of ten or more. This is a huge selling feature! The view from the ATV is nicer. You ride lower, so it's a more comfortable feeling. Mounting and dismounting are hugely easier - you can get on from either side, and don't need to contend with so many levers and a huge steering wheel. Even if you can't see what you want from the seat, it's a simple matter to stand up and gain a great new perspective. Surprisingly to me, the ATV doesn't turn quite as tightly as I would have expected. Not a huge deal, as it is still much easier to do three or more point turns on the ATV than the tractor with the loader on the front and the grader blade on the back. The next big test will be to see how it performs on the bush trails without the plough. That, and skidding a log or two back to the sawmill. I did not really relish the thought of heading under the sauna floor in winter to pour boiling water on the drain lines to thaw them. I had purchased two different heat cables to wrap around the lines and plug in to see if that would work, temporarily, but each of the cables insisted that they needed to be insulated, and that they were a preventative measure, and were not really capable of thawing already frozen lines. Sigh. I came up with the notion of putting one or two small electric heaters into the crawlspace and letting them warm up that area safely and easily. I purchased two small heaters and then ran the generator for the better part of a day before heading down to see what they had accomplished. I was sorely disappointed. They seemed to have barely put out any heat, and I couldn't say that they had made any more difference than just running the stove throughout the day with the cover off the crawlspace entrance. I did notice that the floor drains had open water in them, rather than ice, so I actually put my lungs into service, and crouched down on the floor and *blew* down the drain. After a moment's hesitation, water burbled up through the OTHER floor drain. This told me that everything was thawed between the two. I poured a few cups of boiling water down the drain and blew it through to ensure everything was melted. I then did similar to the laundry tub, although I was unable (unwilling?) to try to get my head to the bottom of the sink to blow out the ice there. Instead, I exercised some patience. Finally, I bit the bullet and crawled under the floor. Imagine my surprise (delight?) at finding that there was no ice in any of my drain pipes down there. I shook them physically all the way over to the foundation wall, and realized that the blockage was outside somewhere. Grandpa had dug out the greywater pit and insisted that there was open water there, so the end of the pipe wasn't the location of the blockage. Instead, we dug out the pipe just outside the sauna. In hindsight, this is a somewhat obvious spot - it had no cover whatsoever besides snow. It ran directly across solid (likely very cold) rock. In our defense, it WAS still on a fair slope, but we decided to go low-tech. I simply cut off the pipe about eighteen inches outside the foundation. This ensured that everything should drain away from the sauna, and that I can easily assess the drainage at any time. In the spring I will either re-connect to the greywater system, or else simply screen the end. In any case, cutting through the pipe revealed an immediate block of solid ice. I poured some boiling water over the end until a chunk came out. Then I proceeded to pour some water directly into the open end of the hose and held it up so that the water flowed in towards the blockage. Hold a few seconds, then drop the hose to drain it. As I felt the water draining out, it was ice cold. Clear indication that the ice was being melted by my boiling water. That was a good sign! As they say, lather, rinse, repeat. I repeated this four or five more times, until the amount of water flowing out was clearly more than what I had poured in. After a burble or two, a gusher! Yeah! The sauna drains were open! Grandpa wedged a board over top of the drain to keep it sloping downwards, and I giddily reported back to Donna a success! I fired up the sauna and we bathed that evening using melted snow. We hope to do laundry next time by hauling a few buckets of water from Mummu and Grandpa's place. 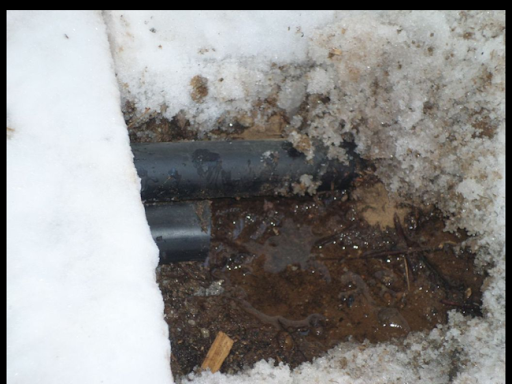 I still fear that thawing the main water line from the well may be a bigger challenge. In as much as we are choosing simplicity (or at least, professing to), we are part of a generation that would find life without internet access to be a bit too primitive and limiting to stomach. We were very blessed to have found an early internet solution that worked amazingly well for us. SpeakOut Wireless offered SIM cards with unlimited "browsing" for only $10 per month! I didn't hesitate to do a test run on our iPad (which has 3G capability) and found it worked marvelously with a few caveats. Their network ran through a proxy server which seemed to block a number of services. While we could surf and email without a problem, and watch youtube, we were blocked from downloading apps or using any instant messenger platforms. These concessions were totally acceptable at the price we were paying. I reread the contract, which stipulated that you could not use the SIM "in a device in a manner to which it was not immediately designed" - I believe they were talking about tethering, something that was somehow blocked by their proxy anyway. 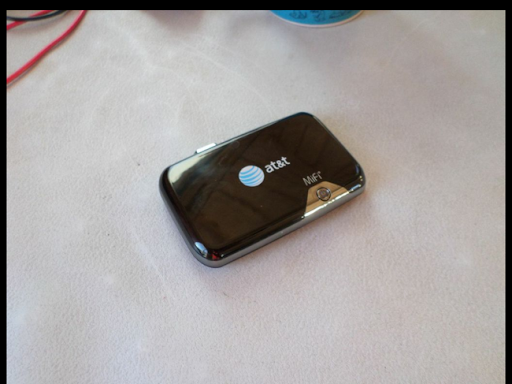 After a few failed starts, I was able to find a genuine AT&T mifi router which worked with our SIM, and that opened up a whole new world for us. We could download podcasts to our phones and ipod to listen to after dark! And, technically sharing internet amongst multiple devices was exactly what it was designed to do! On top of this, we could then easily take the internet with us on road trips! Alas, eventually the party ended. One evening when friends came to visit, I magnanimously told them to hook on to our wifi - they couldn't, and I suggested I would take a look in the morning. That's when I noted that I too couldn't connect. The next morning, I investigated further and found that we had been cut off. Apparently the unlimited browsing was actually only 2GB. I'm not sure who had more cause to argue - me for getting cut off at 2GB when they clearly advertised unlimited - or them, because I was really bending the intended use of the SIM with my choice of a router instead of a phone for the SIM. This suspiciously coincided with their eliminating the unlimited browsing option to introduce a new pay plan - $10/100MB. A ridiculous plan, even for the most frugal of users! I switched to TBayTel's SIM package, but it proved to be prohibitively expensive to pay per GB used. With the initial tier set at 500MB, downloading a Windows Service Pack for one of my clients could wipe out a month's worth of internet in an hour. Luckily TBayTel also offers a Motorola "Canopy" service. Although it has a high up-front cost for the equipment (about $300), the monthly cost of $40 buys me between 1.5 and 3Mbps download and no bandwidth caps. 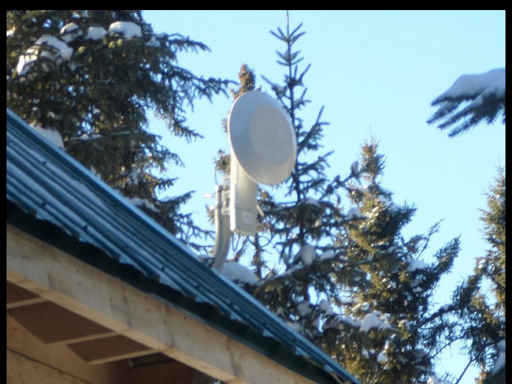 A month after applying, we were approved for installation and the fellows arrived in twenty below weather to put up the small dish involved. My fears that we were not in a good location were assuaged when they laughingly described how they were able to get a good signal with the dish still sitting in their laps, in their truck, without even worrying about properly aligning it or any of the tweaking involved. One down side is that the dish requires a small wall-wart transformer drawing between 1 and 2 amps. This cannot be helped. We also have the wireless router drawing about the same, so I have ordered up a really low power router (USB powered) to complement this system and see how that works. After two weeks, suddenly the connection dropped. It became intermittent and then non-existant. The installers arrived a week after I called and reported that the problem was that the signal was "too strong" and the dish was getting "flooded" with signal. TBayTel turned down the signal remotely, and things worked for an hour or two before we left on Christmas vacation. We returned and the internet worked for about a day, then the same thing... Intermittent, and then non-existant. Annoyingly it took over a week for them to get back to us. 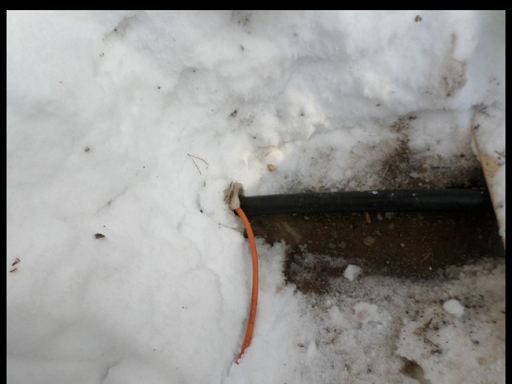 I suppose the thirty below temperatures didn't help with their ability to keep up with installations. One has to be pragmatic in these situations. Finally they came back and simply replaced the dish. They re-aligned it with an even stronger signal than before (54 dBi and a Jitter of 2, for people tracking that sort of thing...) They insist that any further problems will definitely be at the tower/TBayTel end of things, not with my installation. We had internet for a couple more hours until the sun shone down strong on my solar panels, driving up the voltage over 15.5 volts, which trips my inverter and we have to wait until sundown before we can turn the power back on. If you are reading this blog post as is, then the internet came back with the power. Otherwise, I'll complain further below :). It's hard to define exactly why we are doing what we are doing. Our motivations and expectations can change from month to month and year to year. I'm not sure if this is true for everyone, but I suspect it is part of the human condition. As far as being in nature, and close to nature, I think my first real yearning for that came growing up in Wellesley and having "My Side of the Mountain" read to us in public school. It really planted the seed of being independant, and in nature, but still being connected to a select group of close, like-minded friends. Back in Kitchener, married and with a child, we had rewarding jobs (either through satisfying work, or satisfying pay), a cute house in a nice neighbourhood, friends and family close by, and many amenities. But still, like many people, we yearned for more space around us, more freedom to set our own schedules and make more of our own choices. We also felt that we could make a more sustainable future for our future generations by trying to provide more of our own food and energy. It's funny how so far into the project we are learning that living "off the land" is more capital intensive than we first expected. We figured that shortly after getting here we would be providing for a good percentage of our own inputs (food, energy). The truth is that aside from a few blueberries and saskatoons, we have probably ended up with much LESS of our own supplied food than in the city. This is still something we are hoping to significantly change though. The priorities of shelter, water, and heat have all taken precedence over food - which in Canada is still an amazingly cheap commodity to purchase. While we supply all our own energy for heating ourselves, our food, and our water, it does come at a small cost in terms of the chainsaw and tractor. The initial costs of those items, and the ongoing costs of repair and petrol for them will likely mean that the cost/benefit analysis must be looked at over a longer term than we may have hoped. This experiment has been a real eye-opener though. While we haven't been driven back to the city, we are learning that it has its own marvelous attributes to offer. It's nice to be out here in nature, but it also does mean that trips to the grocery store burn much more fuel than they did in the city. It's nice to be off-grid using solar power, but it is expensive, and needs to be rationed carefully. We're especially blessed to be able to spend so much time together as a family. We have been playing board games and helping Kenny with his projects and really getting a chance to form close bonds with one another. But it can be difficult to also sleep together in the same room, and, most of the winter, in the same bed! As long as we keep focused on the progress we are making month by month, we can see how much better our standard of living is becoming. But to compare to the luxuries provided by on-grid or city living it's easy to feel like we've moved backwards. One personal commitment I made in this project is that I would try very hard to not have to give up any of the gains society and technology can provide, while still reducing our footprint on the planet and simplifying our lives. So far I think we are still on track for this, although it is more challenging than one would first expect. Fundamentally, I try to look at all this as a giant experiment. In fact, Donna coined a phrase we have used many times here - "experiments in homesteading". Whenever I come up with a crazy solution to our problems that fails, she helpfully reminds me that those are just as important as the successes. For us, this isn't really, or wasn't really, a choice of an "unconventional" lifestyle. But perhaps it has worked out that way. We wanted it to be more of an "early-adopter" lifestyle, reflecting where we think perhaps many people will go, or want to go, in the future. And we can try to help them find an easier, faster, more rewarding path to their own peaceful and prosperous life. To anyone contemplating a similar lifestyle change, I would suggest that having a good support network (and buckets of money) are integral. We couldn't have accomplished half of what we have here without Mummu and Grandpa nearby. Additionally, I am finding the most difficult part of this endeavour to be the mental one. This past holiday season was difficult for me. The passing of my Grandfather and family friend in the south, and people providing more skeptical questions than positive affirmations of our work here was a bit demoralizing. One needs to have a good sense of self confidence and the ability to appreciate the absurd to pass through these fires unscathed. Surely the most important part of any "success" we are having here is because of having a loving and supportive wife and partner in Donna. Her patience with the conditions we are living in is biblical in proportion! It is hard to imagine how even the smallest victories could be enjoyed without her there to share in creating and appreciating them. So I suppose to answer the original question, I feel that the main compulsion to be here is to give us more freedom, both with our time, and our choice of labour - while at the same time letting us move towards a more sustainable and involved future with our son. Here's my own version of these videos... Fun and weird! Boiling Water vs. Thunder Bay Winter. 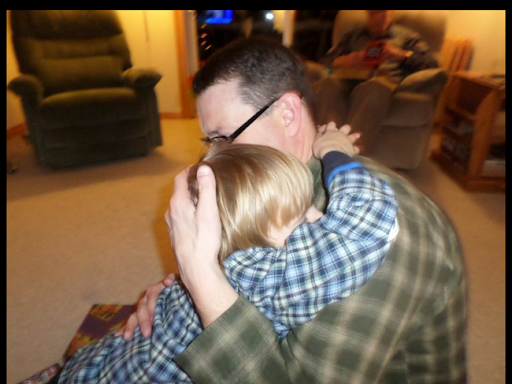 This has been quite a Christmas and New Year's period here on the homestead. Just before we were to leave for the sunny south, we realized that not only were the drain lines in the sauna frozen, so too were the water line from the well, as well as the drain line in the cabin. Not a very thrilling thought as we moved into the holidays. It was very nice to return to our friends and family in the Waterloo region. Attending the candlelight service at church, seeing BY! not twice, but three times, congratulating my brother and his fiancee on their recent engagement, and just spending happy times with Kenny's Nana and Papa and Aunt V!, were real highlights. It also was a bit somber for Donna and I to take the time to go visit my Grandfather's grave, as well as that of RL! who passed away within a day or two of my Grandpa. Other nice visits were with our neighbours in Kitchener who both looked to be in good health and great spirits. Same with BY! 's sister and mom who we dropped in on at the same time. And Donna enjoyed a lengthy coffee out with M!, and she and Kenny had a fun lunch out with L! and J! As stressful as it was to be reminded of my trials here on the homestead, I could sense the caring nature of my parents as they commiserated as best they could with our ongoing water dilemma. Since we have returned they have forwarded me some valuable links to consult to see if we can lick this problem satisfactorily. 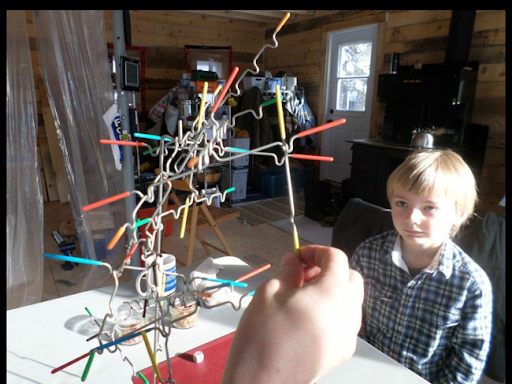 While I don't believe I have spent much time on the blog discussing our approach to Kenny's education, it's also a point of interest and discussion over the holidays with the grandparents and extended family wanting to see how he is shaping up. You see, we are currently "homeschooling" Kenny - finding that it is a good fit with the lifestyle and situation we are in right now. 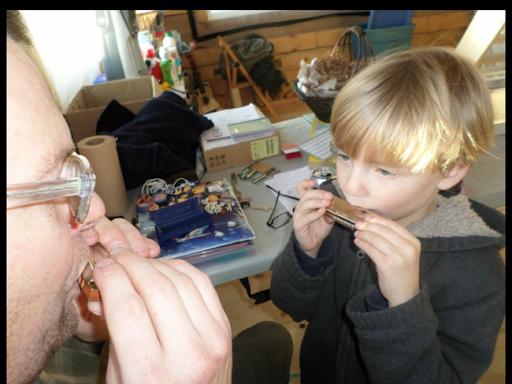 Although I do occasionally try to present him with concrete lessons at times, and we work through lesson books and educational materials that we have accumulated over time, we also encourage him to pursue his own interests. Thank goodness for things like YouTube and the Khan academy. Kenny seems to really be drawn to math and science, but we are always gently guiding him towards literature and the arts as well. 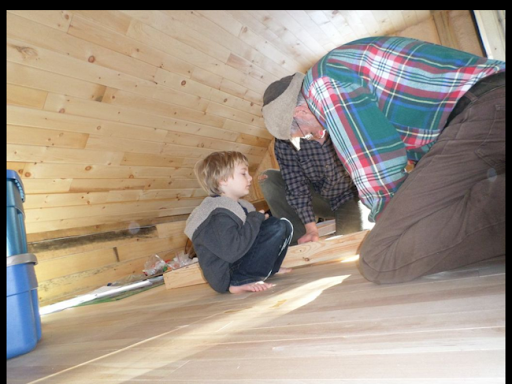 It is nice to imagine how future Christmases may be spent here on the homestead once the cabin is more finished. Hopefully some year soon WE can play the hosts to our families to help repay all they have done hosting us throughout the past decades. Kenny was able to have a full on Christmas when his basic criteria was realized ("Christmas isn't over until I get some Lego" he declared). I suppose when you are six years old you have come to have basic expectations about the holiday season that must be adhered to. Our flights on Porter Airlines were uneventful but enjoyable. It is a real blessing to have grandparents at both ends to deliver us to, and pick us up from, the aeroports. Returning to the cabin was a treat - Grandpa had put on a fire the day before we were to land, as well as before he and Mummu had left to pick us up. We were able to come home that night to a warm(ish) home. In the subsequent days since we have returned, we have been treated to one delicious meal after another thanks to Mummu's dedication to providing food and fellowship throughout the season. A welcome home meal of KFC, followed by Christmas dinner, followed by New Year's eve, followed by a delayed New Year's eve with AA! and UE!. And then a breakfast of waffles and sausage, and bags of leftovers to bring home. Generously, Grandpa warmed their sauna for us to wash up and take a hot steam. We have been caught in a real deep freeze, breaking numerous records and preventing us from accomplishing much of what we would have liked to. On the plus side, it has been remarkably sunny, and I can see from my charge controller that the batteries have reached the float stage of charging three days in a row. Sadly, they are cycled down completely by the next morning, even with very minimal usage, so I feel that they are not long for this world. I may have to contemplate replacing them before winter is over, something I don't relish at all. While I don't make resolutions at New Year's specifically, this holiday season has had enough bumps in my road to teach me to try to stop and appreciate the things I have accomplished so far and be thankful for my blessings. I will try to embrace the gifts I have been given and let go of the rest.